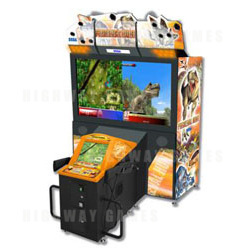 Sega Amusements Europe has announced their full lineup for the upcoming ATEI 2008 trade show, to be held from the 22nd-24th January 2008 at Earls Court, London. On the Sega stand will be Sega's UFO Catcher, Shoot This Win This, Primeval Hunt, Sega Race TV, Mini Rider 2, Sea Wolf, and many more. Sega's UFO catcher will dominate the Sega Amusements Europe stand, with a "Sega UFO Catcher Experience" planned. UFO Catcher is a crane machine where players maneuver the UFO into a winnable position and press the descend button to hopefully grab a prize. Sega UFO Catcher is completely skill based, and winning is based on the player's sill and judgement. As part of the UFO Catcher Experience, the UFO Catcher machine will be displayed as well as hand picked merchandise from Sega Prize Europe. The machine can handle a range of products, including boxed products, iPods, Phones, and plush toys. A sneak preview of Sega Prize Europe merchandise will also be on display at ATEI, including Sega branded licensed products. Shoot This Win This is a carnival style prize vending game where players shoot objects on the screen to gain points, with players aiming to move up the prize ladder and win a prize. There are 6 mini games to play, and each has a different theme and targets to shoot. These range from Loony Moon, where players shoot aliens and UFOs; to Wacky Track where players shoot it out in the Wild West with gold miners. The unit features 7 prize arms which can accommodate small and major prizes, and is also available in a redemption configuration. Primeval Hunt is a gun shooting game for one or two players where you hunt prehistoric dinosaurs, including T-Rex, Triceratops, and Velociraptor. In total there are 10 different types of dinosaurs to hunt across 12 stages. Primeval Hunt features two pump action guns with inbuilt speakers. The cabinet also integrates touch screen technology, with players able to plan their attacks and move easily around the game by using the touch screen monitor. The game comes in standard and deluxe models, with the deluxe version featuring a giant 62" screen. The machine is on general release from Feb 08. Sega Race TV is a racer powered by the Lindbergh system that has a distinctly American theme. The game is a twin driver which is linkable with up to 4 players able to race together at a time. Five courses are available, including Sunshine Coast, Jake's World, Sunshine World, Slip Circuit and a hidden track. The cabinet features a special boost button beneath the gear shift, which when charged makes your car accelerate. Race TV features 9 licensed cars including makes from Ford, Chevrolet and Mazda. Mini Rider 2 is a two-seater motion ride simulator from Sega which uses a patented inverted motion system. The inverted motion system has the motion system positioned at the top of the cabinet, which leaves players suspended in mid air. There are 4 different rides to experience, including a roller coaster ride, a space journey through the cosmos, a ride through icy glaciers, and a ride through an underground mine shaft. Sega Amusements Europe have the sole distribution rights, and ATEI 08 will mark the products European debut. Also on display on the Sega stand will be Sea Wolf, a redemption machine that requires the player to fire torpedoes at subs and other boats through a periscope control. Other products on show include Ghost Squad Evo, Pin Air, Let Me Dance, and the Outrun 2 attraction. Sega's dedicated spares division Sega Total Solutions (STS) will also be on hand at the show to speak directly with clients and will also display a range of spares.